BookToday has a wide range of accommodation close to the action of the Gold Coast Show. 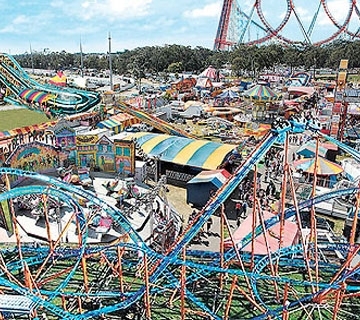 The largest Community event held on the Gold Coast - the Annual Gold Coast Show celebrating its 104th Show. From the moment you enter the Goldsteins Bakery Gold Coast Show there will be no shortage of Entertainment â€“ and best of all most of it is part of your Show ticket admission. To be held at Parklands Showgrounds, cnr Smith Street and Parklands Drive Southport the 2010 Show will take place on Friday 27th August (Gold Coast Show Public Holiday) Saturday 28th August and Sunday 29th August, gates are open 9.00am to 9.00pm Friday and Saturday and 9.00am to 6.30pm Sunday. Showcasing the Gold Coast is about people, lifestyle, art, education, sports, hobbies, interests and innovation and the Goldsteins Bakery Gold Coast Show provides an excellent programme that encompasses all this.